People instinctively know how to tell stories: about themselves, their lives, and the world around them. Despite this, it is not easy to tell good stories. 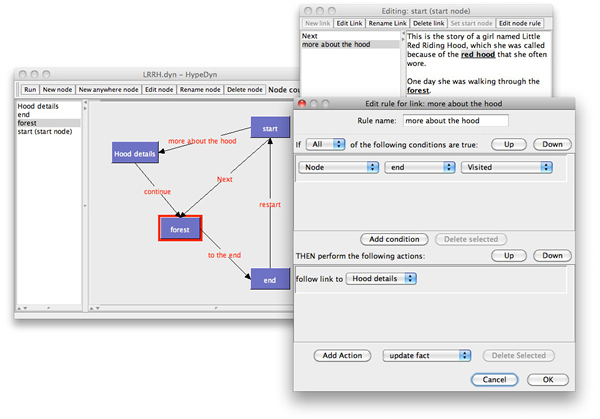 It is also not easy to tell stories in computational media, which requires awareness of how to make use of the affordances and limitations of this new medium. These projects all attempt to address, in various ways, the question of how to create tools that can help people to tell stories. The sharing of significant personal experiences, or 'family stories' remains an important part of what it means to be a family. This research explores ways in which a mobile storytelling app could help overseas domestic workers to capture personal experiences and stories to be shared, later, with their families back home. This project is part of Cheong Kakit's MA thesis. This project explores ways to support collaborative storytelling. More broadly, we are interesting in communication and coordination during collaborative creativity. 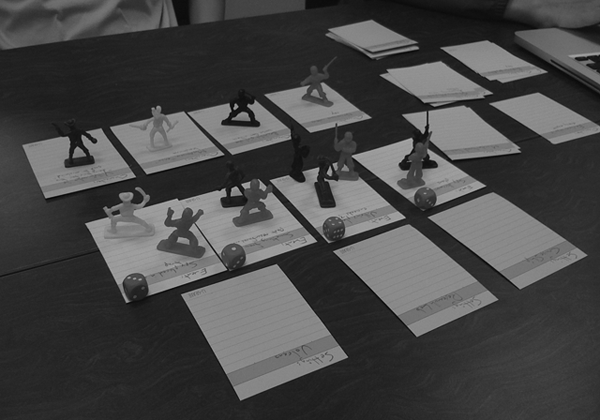 Storytelling games are a form of competitive storytelling framed in the context of gameplay. This research explores the design of storytelling games that balance storytelling and gameplay by encouraging narrative play. This work focuses on the ways that people respond to interactive works that involve stories, play and aesthetic response, and the ways that interactivity can be structured to create an aesthetic response. One measure of what makes a story good is whether or not people want to go back and reread the story. This research investigates what it means to reread a story in the context of stories that potentially change as the result of reader choice. This project began as Alex Mitchell's PhD thesis work. 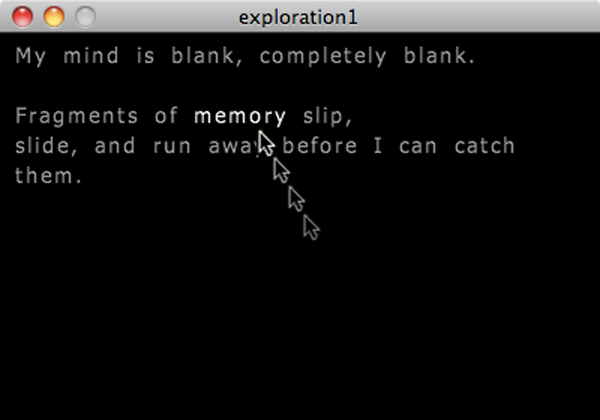 This project explores Victor Shklovsky's notion of defamiliarization, and how this concept can be applied to the study of games and interactive art to understand what makes a particular interaction poetic. This research explores how the process of closure in comics changes when the act of "crossing the gutter" involves choice or action on the part of the reader. This work is based on Tiffany Neo's honours thesis. This research examines the ways in which anticipation can be seen as an aesthetic response, and how this type of aesthetic response is manifest in the context of interactive art. This project is part of Jing Chiang's MA thesis. This work considers how a sense of this subjective life experience is transmitted to the reader/audience/interactor in life stories in different media, with a particular focus on interactive media. This project is part of Evelyn Chew's PhD thesis. There is a long tradition of wordless storytelling, including forms such as childrens' picturebooks, wordless comics, and mime. This work explores how storytelling without verbal or written text takes place in games. This research is based on Sim Yuin Theng's ISM. This work looks at new ways of representing design knowledge about creative practices such as storytelling and game design, and new methods for studying these practices and the resulting artifacts and experiences. This work explores the use of Christopher Alexander's pattern language approach to help people to write stories. Using the Clinical Interview to Study "Things That Change"
This research investigates ways to adapt Jean Piaget's clinical interview technique for the study of adaptive, interactive systems, focusing in particular on interactive stories, games, and interactive art.